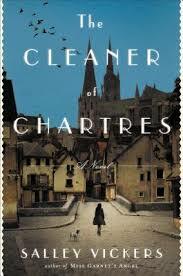 a book chick: "The Cleaner of Chartres"
my take: This is a quiet novel that runs deep. Agnes, the cleaner, appears to be a blank slate upon whom several townspeople project their fears, sorrows, needs, and trials. As her story is told between her present life in Chartres and her younger years in a convent (pay attention to the chapter titles) we learn the events that shaped Agnes and brought her to the Cathedral. I try not to glean any information about a book before reading ... so I skip the back cover and flaps to avoid learning anything about the plot (why do they give away important information?!) After reading, I learned (from the back flap) that the author is a Jungian psychotherapist ... which explains the profundity of this seemingly simple read. Knowledge that may enhance the reading experience. Scads of topics to discuss in this psychological treasure trove: religion and doubt, intellect, paganism, psychological treatments, abandonment, belonging ... to name a few. We book chicks had a good discussion. And carrot cake. my verdict: Good read - I wish I'd read before I visited the Cathedral last spring. "Quiet" and "runs deep" are quite apt descriptions, I think. I really enjoyed it and bet it would make a great book club discussion indeed.